Note that there are many features and functions built into BimlFlex that don't require Extension Points. Parameters, custom source queries with joins and filters, inherited tables and columns, data type expansions etc are all available without the need for Extension Points. name Name of the entity this extension point targets: “sourceTable”, “targetTable”, “connection” etc. type This is the entity type: “string”, “BimlFlexModelWrapper.ObjectsWrapper”, “BimlFlexModelWrapper.ConnectionsWrapper”, etc. Here we will describe how a BimlFlex extension point can inherit the attributes and related items from an object that we are trying to modify. This is useful because, in some cases, properties relating to a certain object are required as part of what is needed to effectively do what we want to in an extension point. This section of the document covers the biggest variation of how extension points are used. However, there is a fairly exhaustive list of extension points available within BimlFlex. Here we will mainly be looking at demonstrating why a certain type of extension point will be used in a solution. Project based extension points are helpful, particularly because, depending on the type of solution being implemented, the Project at hand will require items that are not practical to maintain in metadata such as script files and bespoke project parameters. Generally, it is quite useful to have these items centralised within Biml code. Including parameters with extension points, allows greater reusability and logical separation in our solutions. Because of this, the project parameter extension point is useful for storing parameter definitions for high-level project parameters to do with databases and connections. This is important to note because, over the lifespan of a given data warehouse solution, there is a high chance of needing to repurpose the output of BimlFlex. The extension point target, in this case, will be to point to the name of the project we are adding a parameter to. As mentioned, one of the advantages of using extension points is to centralise code in Biml. This is relevant for script tasks as it is for any other complex ETL tasks. The target attribute of the extension point is the project that the script task belongs to. Connection based extension points are useful when adjustments are required to a connection, that is not part of the standard connection that can be implemented through the metadata connections in BimlFlex excel. There are a variety of scenarios where this may be required from Dynamic connection strings to Connections that are derived from custom components. Connection expressions are useful for creating dynamic connections, particularly when the connection string or source that we are connecting to is not known until runtime. For instance, a flat file connection may need to connect to a file which contains a date stamp in the name. Here just like in SSIS, we can enter in the expression we require for this functionality. The target, in this case, is the name of a pre-existing connection that is in a solution. "Dsn=SRC_ODBC;Uid=" + @[$Project::UserName] + ";Pwd=" + @[$Project::UserPassword] + ";"
Batch based extension points are generally only different from the other types of extension points in that their purpose for being implemented will be quite different than that say, of a package extension point or a project extension point. Batch extension points focus more on the processing of groups of files or data sources prior or post data load. We will see examples of this in the section to follow. The target will be the name of the batch that a user is trying to modify. Batch variables are fairly common, particularly if there are child packages that intend to inherit these variables. In terms of how the variables are defined these are effectively the same as any other package variable. The target is the name of the batch package. This is another example where the differences in code between regular package configurations and batch configurations are minimal. Below is an example of how to implement batch level package configurations. Sometimes it is useful to add references in a batch package to a connection order to make a connection available to a given batch. This example will show how this can be implemented via extension point. The extension point target is the name of the batch package we are trying to modify. For more on how to create connection references in Biml see the following resources. Batch pre-process extension is used when there is a need to perform an overall process prior to executing a large set of packages. For instance, this can be to prepare a source data set or arrange a sequence of files before extraction. Either way, there is a wide variety of application for this particular extension point. The extension point target is the name of the Batch. For more information on how to develop packages tasks in Biml see the following resources. Similar to the pre-process extension point in BimlFlex, the post-process extension point is useful for large operations or tasks that require processing items after a load has completed. Examples of this could be moving process files, archiving processed flat files or uploading data to and external source after a load has completed. Again, a number of applications here are many and varied. The extension point target is the name of the batch package. Object base extension points are generally used for making adjustments to packages that load only one table in its execution. This particular segment of extension points contains the most variety in terms of what is available in extension points as this where most of the modifications are needed. Not only do we have the ability to modify what happens before and after a load, but we have the ability to adjust and add sequence containers for a particular purpose within the data flow itself. The object script file extension point is mainly used because it allows us an easier way to centralise our script tasks in Biml code whilst not having to hold its entire definition with the package templates. 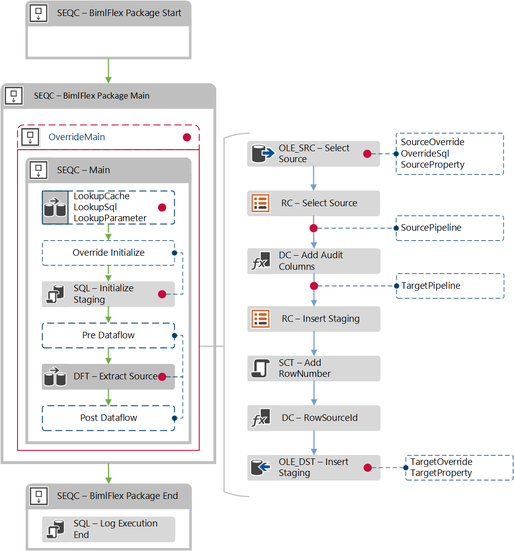 This then can be referenced from the BimlFlex code that manages the generation of SSIS packages. The target of this extension point is the name of the table object that is the source of this package. This extension point will be used to define new variables in a given package on the object level. It should be noted that the way a user defines a package, in this case, is no different to how a batch package variable is defined, is it simply the way in which the extension point is targeted that is different. Package parameters can be implemented through extension points also, this is generally done when there is a bespoke parameter required for a particular purpose. The parameters defined in packages are usually used in conjunction with other extension points that make use of these parameters later in the ETL pattern. The target is the source object name. The Override SQL extension point is a more common extension point that is used to fully replace the select statement used in a source component. This is useful for scenarios where more complex source queries are required. The Override Main extension point is used for completely replacing the main sequence container of an object package. The reason this can be useful to a user is in scenarios where it is easier to take a pre-existing package, convert this into Biml code through the BimlStudio import package tool and insert that new Biml code into the Override Main extension point. This way we can easily add an existing package to BimlFlex and also centralise the code for a given BI solution, which helps with maintainability. As the name suggests this extension point is used for scenarios where a user needs to insert logic just before the data flow begins. In some scenarios when we use connection expressions or dynamic variables that change over multiple executions, it is useful to have the ability to add custom logic just before the data flow begins. Note that if this extension point is used, it will make it the first task in the control flow for the main sequence container as so the output pathname variable will need to be included. The target is the name of the source object. Similar to the Pre-Dataflow task, the post data flow tasks purpose is to add logic to the main sequence container just after the data flow task has ended. Again, if we are using connection expressions or variables that change after each execution it is helpful to be able to add additional logic at this location. The pre-process extension point is located before the main container in the control flow. This is a fairly common extension point mainly because it is helpful to have logic that can be added where we may need to do some work in order to obtain the data that we want to load. This is the case in scenarios where we must download flat files or run some SQL code to help prepare the data we want to load. Note that because this extension point encloses the new logic inside a sequence container, input and output path variables are not required. The post process extension point is useful for custom logic that needs to be applied after the end of the main execution of a given package. Scenarios that require archiving or uploading of data to a different location are typical cases for when this extension point is used. Note that because this extension point encloses the new logic inside a sequence container, input and output path variables are not required. A source override extension point is similar to the override SQL extension point, but this is used when we want to completely replace the source component rather than adjust or replace the source query. Remember that when the source component is changed in this fashion, consideration should be made to the columns and datatypes that are expected in the remainder of the data flow. The extension point assumes that the changes made using this extension point align with the rest of the data flow. A source parameter extension point is used for when we want to use a predefined parameter as a parameter to be mapped to our source component. This extension point is used for inserting a data flow or multiple data flow tasks into the standard ETL data flow. Note here that the final data flow task that you define will need to have the name in the value of the OutputPathName variable. This extension point is mainly useful for adding custom data flow transformations to the existing data flow.